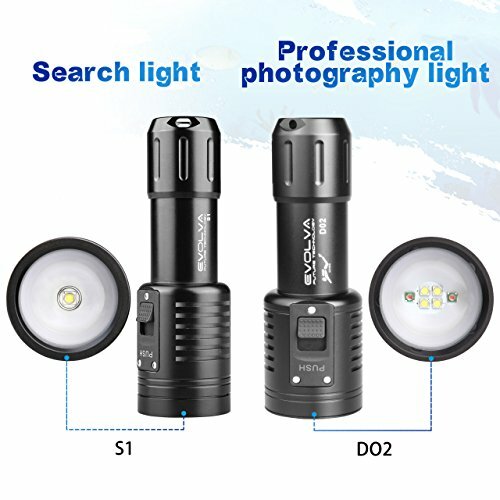 PHOTO/VIDEO LIGHT: This EFT D02 light is a great choice for any diver taking video whether it be Go Pro or other light performance requirement. The EFT D02’s brightness is generated by 4 x XLamp XP-G2 White LEDs and 2 x XPE red LEDs with a color temperature of 6500K. 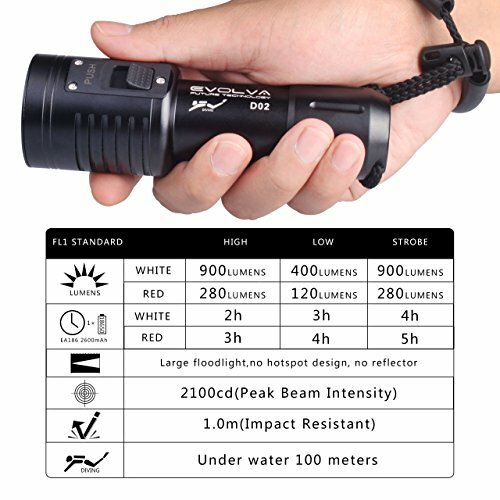 Equipped with 2 built in XPE red LEDS, D02 is great for lowering the color temperature and creating a great light for viewing all types of sea life. WIDE ANGLE BEAM: Although D02 is a compact and powerful all-purpose dive light – but is best suited for video purposes with a 110° degree beam angle .Great Coverage! BRIGHTNESS AND MODES: This light generates Max 900 Lumens light and offers 4 power settings and 2 SOS settings controlled by a reliable push-button. The output in the red led mode is 600 lumens. 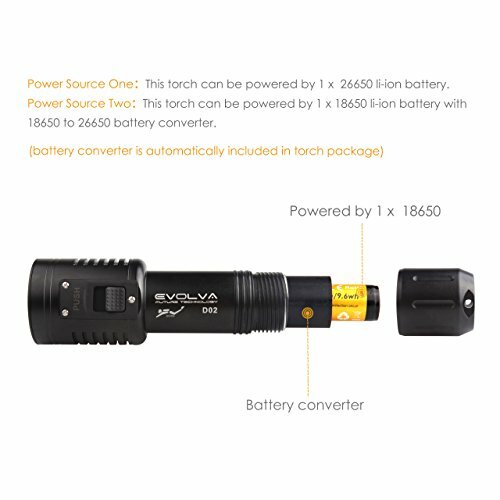 It is powered by 1 x 18650 rechargeable li-lon battery or 1 x 26650 li-lon rechargeable battery. Want to take amazing photos and video of the stunning sea life??? D02 Video/Photo Light offers many features making it a great choice for any diver taking video with Gopro or other underwater camera system. 1.Beam Angle: Wide 110º Degree, Great Coverage! 4.Built to last the light is manufactured from aluminum alloy that may be anti-corrosion anodized, is sealed by a double O-ring providing a depth rating to 330′ (100 meters). 6.The light head has a tempered optical glass front lens. Strong enough to withstand deep water pressure. PHOTO/VIDEO LIGHT: This EFT D02 light is a brilliant choice for any diver taking video whether it be Go Pro or other light performance requirement. The EFT D02’s brightness is generated by 4 x XLamp XP-G2 White LEDs and 2 x XPE red LEDs with a color temperature of 6500K. 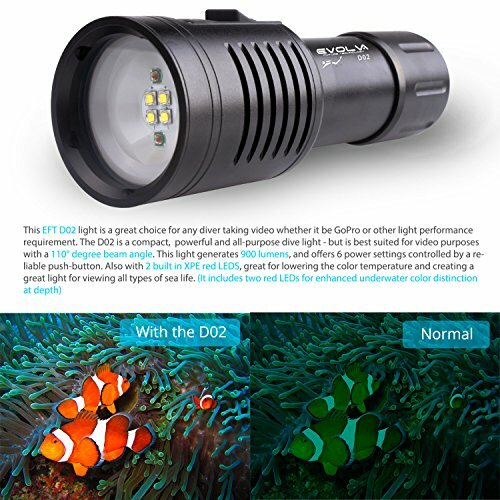 Equipped with 2 built in XPE red LEDS, D02 is great for lowering the color temperature and creating a great light for viewing all types of sea life. WIDE ANGLE BEAM: Even supposing D02 is a compact and powerful all-purpose dive light – but is most fitted for video purposes with a 110° degree beam angle .Great Coverage! 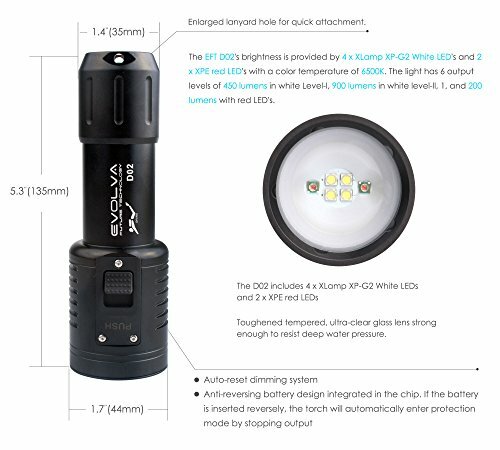 BRIGHTNESS AND MODES: This light generates Max 900 Lumens light and offers 4 power settings and 2 SOS settings controlled by a reliable push-button. The output in the red led mode is 600 lumens. 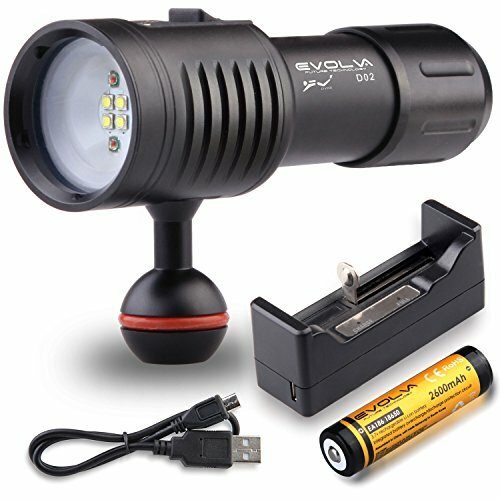 It’s powered by 1 x 18650 rechargeable li-lon battery or 1 x 26650 li-lon rechargeable battery. 1 INCH (25 mm) BALL JOINT: D02 also comes with 1 inch (25mm) in diameter ball joint for simple mounting to any-camera system. The joint may also be easily installed for camera system and easily uninstalled for handheld use. 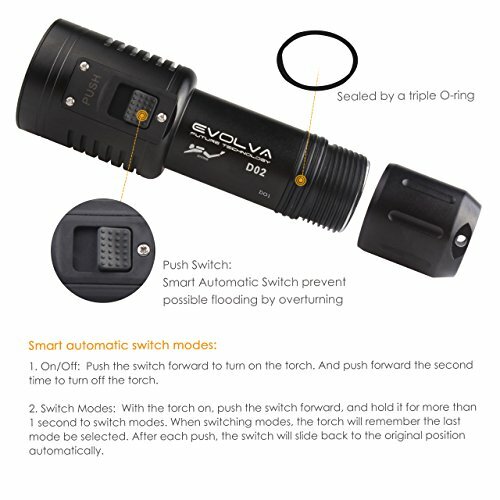 BUILT TO LAST: Evolva Future Technology D02 is manufactured from aluminum alloy that may be anti-corrosion anodized, is sealed by a double O-ring providing a depth rating to 330′ (100 meters). The light head has a tempered optical glass front lens. Strong enough to withstand deep water pressure.